The Museum of Science and Industry is just steps from Lake Michigan and minutes from downtown, The Museum of Science and Industry, Chicago (MSI) is a unique space where attendees can indulge their imagination with a myriad of vibrant & interactive exhibits. MSI is a premier destination in Chicago for unique & engaging special events; just imagine your guests dining beside a WWII German submarine, plunging into a working coalmine, or standing inside a 40-foot tornado! Navy Pier is centrally located on Chicago’s beautiful lakefront and makes any event spectacular. Navy Pier is a full service convention center that features: a Grand Ballroom for corporate and social events, facilities perfect for trade shows, meetings and corporate retreats. With over 250,000 square feet of flexible space, Navy Pier has the ability to host groups as large as 3,000. Summit Executive Centre is the only conference center in Chicago that is accredited by International Association of Conference Centers, IACC. Located on Michigan Avenue, at the foot of the Magnificent Mile, The Summit is just steps away from premier shopping, entertainment and Millennium Park, and is conveniently located to both O’Hare & Midway International airports. The Summit offers clients 20 dedicated meeting rooms, all with the latest technology and a 100% ergonomic environment. The Summit is ideal for training, business, board, and corporate meetings and events. With two unique Chicago campuses, Lakeshore (Roger's Park) and Water Tower (downtown Chicago), Loyola University Chicago is a premiere conference and event destination, on a college campus and in the Chicago area. Loyola offers access to cultural institutions & activities, as well as natural resources, which include Lake Michigan and miles of lakefront parks. The university offers clients year round meeting facilities for up to 700 guests, elegant ballrooms, electronic classrooms, tiered auditoriums, and seasonal summer housing for up to 1,200 guests. The Department of Conference Services at Loyola University Chicago provides the perfect setting for conferences, workshops, weddings, special events, and programs that is welcoming, hospitable and organized. University of Illinois at Chicago Event Spaces is just minutes from downtown Chicago, with event spaces to accommodate small meetings, banquets, conferences, NCAA-regulation and professional sports events, and concert seating for 10,000 guests. University Center Conference Chicago is located in the heart of downtown Chicago and offers exciting meeting and conference facilities that cater to the needs of both large and small groups with summer housing accommodations available. Combining superior business services, advanced technology, on-premise catering, and overnight accommodations with a dedicated, professional staff, University Center promises to make your event an enjoyable experience! Visit Unique Venues to find even more Chicago event spaces! 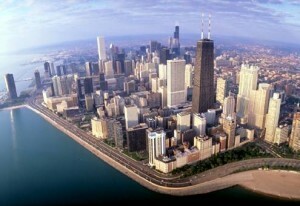 With so many fabulous unique venues to meet your every event need, a central location and a culture unlike anywhere else, it is no wonder that Chicago is one of the top 5 meetings destinations in the United States!